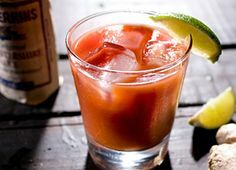 The Bloody Mary cocktail is definately not for everyone, but if you like them then this is a classic recipe that is sure to have your taste buds screaming for more. You can easily find many other Bloody Mary recipes out there with subtle differences, but this is the original and the best tasting recipe. As with many other recipes there are no lack of theories about the origins of this fabulous tasting cocktail. The truth is that it was invented by an ex patriot named Fernand Petiot, at Harry’s New York Bar in Paris. It was thought to be around the early 1920’s that he developed this recipe, making it one of the oldest cocktails out there. He originally combined equal parts of vodka and tomato juice. George Jessel developed the drink from this original formula, in the late 1930’s, into the Bloody Mary that we know today. It was originally called the “Red Snapper,” but the name “Bloody Mary” eventually won popularity. This cocktail is comprised of many different ingredients, but do not let that deter you from making it. It will be well worth it. Just watch out later on in the night, as you may notice your Bloody Mary getting stronger and stronger. Here are the ingredients that you need to make one serving. First, fill the shaker with ice. Next, add vodka, tomato juice, lemon juice, black pepper, celery salt, and Worstershire Sauce to the shaker, and shake well. Strain your concoction into a glass filled with ice cubes. Add a dash of Tabasco. Finally, garnish with celery stick, and serve with a straw. More vodka can be added, according to your taste. This drink, like most other cocktails, is best with top shelf liquor and name brand products. It can also be poured over ice and stirred, instead of shaken. One of my favorite variations to this drink is the “Bloody Pirate,” in which the vodka is replaced by rum. The rumor is that the Bloody Mary will cure your hangover blues. I guess that it may be possible, but I can not, in good concience, tell you that it is absolutely true. The Bloody Mary is a great brunch or cold weather drink, though. Have fun making this king of cocktails, and remember to drink responsibly. Feel free to ask questions and leave comments. What can I say? Bud is a very light American-style pale lager with a crisp, metallic finish, it pours as clear as water and with an abundance of quick and tasteless bubbles. I will admit to having drunk plenty of it when it was on sale and I was in college, but let’s face it, whatever can be said about Budweiser being an icon of American marketing, it is not a very good beer. Along with other major players in American and worldwide beer sales, Budweiser is obviously more concerned with market share than with taste. Hey, but that’s OK, as the world gets smaller and smaller, our choices are greater and more varied and there are plenty alternatives available so that no one should ever have to settle for Budweiser. Of course, I do have a good pal who turns his nose up at the dense head and thick flavors of most imports and micro-brewed offerings – he brings his own 12-pack of BudLight when he comes to my house. I can’t understand it. I once bought him a Stella Artois on tap at a bar because he said he wanted something “light” – I thought I was doing the right thing since I had ordered something that looked more like a light coffee with a whipped head of foam for myself – but he took one drink of the light Belgian lager, gave me a screwy look and then handed it back to me. I saw him later with a BudLight bottle in hand. Apparently, there are some several tens of millions of people out there like him who would drink Budweiser even if if Anheuser-Busch didn’t wrap it up like the Fourth of July in red, white and blue bikinis, race cars and Clydesdale’s. Go figure. I noticed that Budweiser is cheaper than bottled water, which in and of itself should say something about the product . . . I mean, it is water PLUS other stuff, no? In fact, yes, Budweiser does add other stuff that many other brewers do not, namely, rice and wood. The rice is added to make Budweiser taste even lighter still. The other big American brewers do this as well – I don’t know if this is because Americans actually want their beer so light and crisp or if it’s just easier to make a mediocre beer taste “better” by making it more tasteless. During the lagering process wood chips which have been boiled in soda ash to remove their color and wood flavor are introduced. Lagering was traditionally the period in which beer was stored in small wooden casks during which time the beer picked up a hint of woodiness – since Bud and BudLight are stored in big metal reservoirs the size of small office buildings, they simply pour the beer over some wood chips for effect . . . the folks at Anheuser-Busch call it “Beechwood Aging”. The whole process last three days. In 2007, Budweiser and BudLight accounted for 50.9% of the beer sales in America making Anheuser-Busch the largest brewer in the world. But selling these ultra-light and cheap lagers to a serious beer-drinking country is no easy task – it comes at a huge price. Budweiser spends 10’s of millions of dollars in advertising, though there is no way to fully comprehend their costs of marketing events and teams sponsorship, celebrity endorsements, filming and photography budgets, travel expenses and the costs of maintaining a “drink responsibly” attitude. 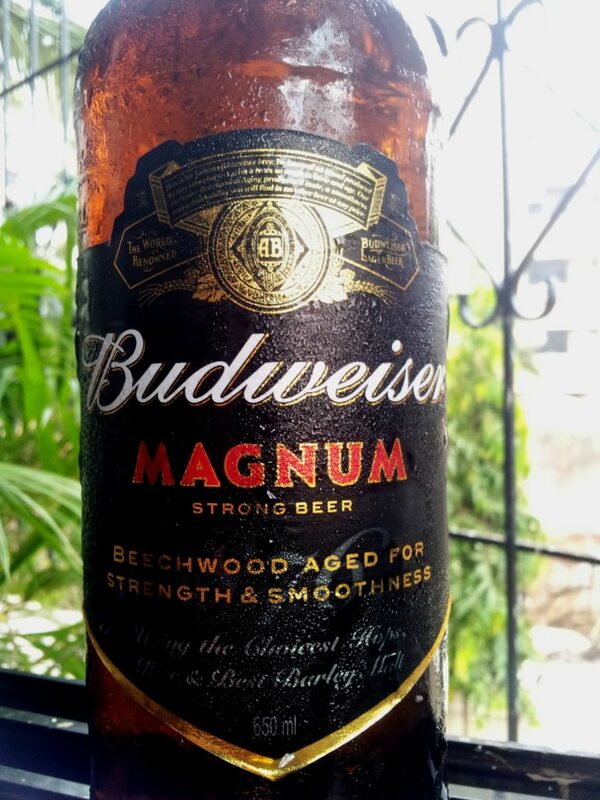 In 2007 the Budweiser name turned a profit of $2.1 million for Anheuser-Busch, so, whatever those costs, it appears that Budweiser and BudLight will continue to stress the primacy of name recognition over taste – it is, after all, that which the public seems to respond best. Then the base of everything: 4-5 counts of Tomato Juice, this decision is decided depending on whether this is your first or second drink, ha. Now the mixing: Using the tin or glass mix throughly, tossing the mixture back and forth from one tin to another or one glass into another. Because of all the compnenets be sure to really mix. After shaking properly, rim a clean large glass with Old Bay. Basically use a lemon slice and trace the rim of the glass, then with some Old Bay on a plate turn empty glass upside-down and coat the rim with the seasoning. The fill the glass with ice and pour mixed contents onto ice. Serve with a celery stalk or if you are feeling extra creative a skewer of cold shrimp. This is a great brunch pick me up or can be a creative cocktail party drink. Enjoy! This is one great tasing casserole. It is very easy to prepare in which it will only take you 20 minutes of prep time. It will take less than 30 minutes to bake. This is a really delicious vegetable dish that will work wonders for a poor appetite. 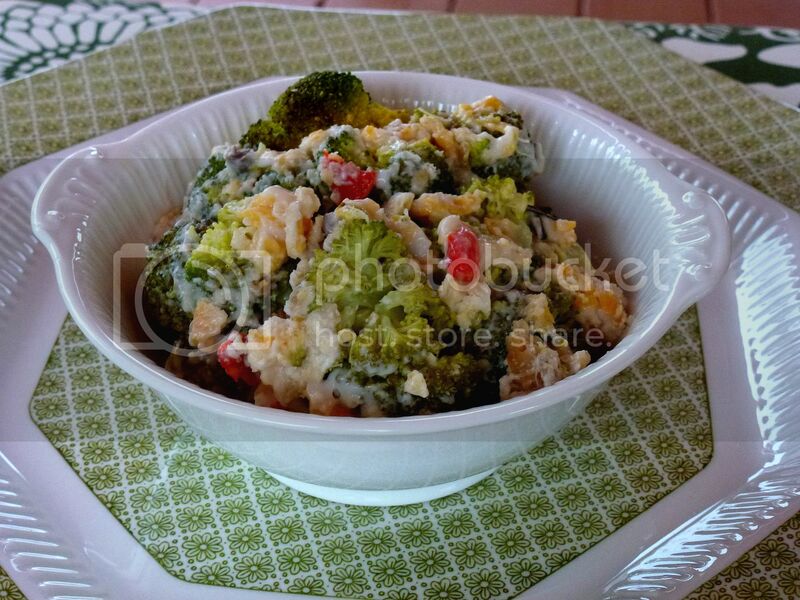 This casserole contains a tender mixture of broccoli and pimientos. This delicious mixture is blended with cream of mushroom soup. It has a rich topping of cheddar cheese. This is an excellent way for getting kids to eat thei vegetables. This recipe will serve 4 people. To make make more servings you will need to double the ingredients and use a larger casserole dish. This casserole’s recipe may vary in which you may substitute another vegetable in place of the broccoli such as asparagus. This is an excellent casserole to prepare the night before baking. If you prepare the casserole the night before then it should be removed from the fridge 30 minutes before baking. This casserole would be great for serving alone or with chicken or beef. It is the perfect dish to prepare for special occasions or a dinner party. You will find that the guests will come back for more. It really is a healthy dish that is rich in vitamins and minerals. Broccoli Pimiento Bake has a great aroma when baking. It is a good dish for the tempting taste buds. IIt is something a little different than the regular broccoli and cheese dish. Enjoy! 1. In a large mixing bowl, combine the broccoli and the pimientos. 2. In a separate mixing bowl, combine the cream of mushroom soup, milk, seasoned bread crumbs, salt, pepper, and parsley. Mix these ingredients until smooth. Aftyer these ingredients are blended well, mix them with the broccoli mixture and stir until well blended. 3. Pour the mixture into a greased casserole dish. Sprinkle the cheese evenly over the top. Dot with butter over the cheese. 4. Bake the casserole at 350 degrees F for 25-30 minutes until well heated and the cheese is completely melted. 5. Serve hot or warm and enjoy! Nests of tiny Asian swifts indigenous to the cliffs along the coast of the South China Sea are rare and expensive, but are the essence of Chinese birds’ nest soup. The tiny nests are almost pure protein from predigested seaweed deposited and formed by the birds and hardened into tiny translucent cups. The nests are highly nutritious and reputed to sustain youth and, although birds’ nest soup is considered an essential element of any feast, many Chinese women drink a small cup as a daily tonic. Most Chinese markets sell the nests in highly decorated boxes with a window where they can be examined. Whole unbroken nests are most expensive and are the only choice for many traditional cooks. Broken nests are available, but ground nest are the choice of most cooks because they are relatively inexpensive and easy to clean. When properly cleaned, the nests have essentially no flavor of their own and are valued for their brittle and unusual texture. Even though the nests depend on other elements of the soup for flavor, these elements must not be too assertive and overwhelm the lightness of the nests. The successful birds’ nest soup is a balancing act that you will celebrate when you recognize you have done it right. Soak the nest in warm water for about 3 hours. Pour into colander and rinse well with cold water. Remove any impurities. Place in a saucepan, cover with warm water and bring to a boil. Drop in the ginger, turn heat to medium and simmer for 5 minutes. This will remove any lingering slightly fishy taste. Do this step well ahead of time. Drain, cover and refrigerate until you are ready to make the soup. Freeze the prepared chicken breast for about half an hour until meat is firm but not frozen. Cut into chunks and mince (do not turn it into a puree) chicken and 3 tablespoons of water in food processor. Add salt, cornstarch mixture, stir well, and then add beaten egg whites. Stir until mixture is fluffy. Cover and put aside in refrigerator. In a large soup pot, bring chicken stock to a boil. Add birds’ nest and reduce heat to medium-low. Simmer for 5 minutes. Turn heat to low. Give reserved cornstarch mixture a stir, pour into soup, and stir until broth thickens. Continue stirring as you add chicken. Turn off heat and continue stirring until chicken is white and the soup is smooth and fluffy. Pour into serving bowls and sprinkle with reserved minced ham. Whether or not birds’ nest soup prolongs youth might remain open to question, but this richly delicious chicken broth is a worthy starter for any meal even when you substitute rice or mushrooms. The bottled water industry has exploded within the past ten years. Why and how did this happen? Twenty or thirty years ago you would have been laughed out of a room if you made this prediction! Except for specialty bottled water retailers such as Evian or Perrier, the bottled water industry really didn’t exist. Now, it’s a billion dollar per year industry that shows no signs of slowing down. Personally, I hate to pay for something as common as water. Just like I was aghast when I saw my first air pump that required me to put quarters in the slot, paying for bottled water goes against my better judgement. I’d rather take the money and buy a soft drink or some juice! But my wife pays for bottled water all the time, and our cupboards always have a least a case of the stuff! And I’m the one who has to lug it from the car up the steps to our kitchen! Is bottled water that much better than tap water? I decided an experiment was in order to try to determine which was better, tap or bottled water. So when my tea-drinking wife wanted me to make her next cuppa and open up a bottled water to boil, I decided I would use good old tap water. I couldn’t wait to see the results of this experiment, and after her tea was made I headed off to the living room, grabbed the newspaper and waited to hear the results. “Yup” I replied, just like the proverbial cat that swallowed the canary. I told her about my experiment, and she really couldn’t believe that her tea tasted so good. So from now on, we save money using plain old tap water to make the tea and the coffee. We’ve noticed a savings in our grocery bills as well, and I’m lugging less water up the stairs. As far as drinking water in it’s natural state however, she still insists on drinking from the bottle. Maybe a new experiment is in order, substituting the bottled water for tap water………. Summertime’s almost here. Time to fire up the grill, throw on steaks and burgers, and have a great time with your friends. But what do you serve alongside your barbecued meat? You don’t want to heat up the house cooking side dishes. That’s one of the reasons you’re barbecuing. Fortunately, some side dishes can be cooked right alongside the steak. Summer vegetables are cheap, and taste fantastic when marinated and grilled. Bell peppers, squash, zucchini, eggplant, and mushrooms cook well. Cut them into coins and toss them in a resealable plastic bag. You can marinate them with anything you like, from Italian salad dressing to Balsamic vinegar. Let the veggies marinate for at least two hours. 24 hours is the best. Grill them 8 to 10 minutes, until shriveled and lightly blackened. Why not toss a few ears of corn on the grill, too? Cook them right in the husk for 20-30 minutes, turning occasionally. Let cool for at least 10 minutes before husking. No barbecue is complete without a green salad. The versatile salad can be as simple as a bowl of lettuce with dressing. Or it can be a complex Italian affair with cheese, croutons, cherry tomatoes and olives. Mexican salads are delicious in summer. Like salsa with more vegetables, they start with black beans and build in corn, avocado, diced tomatoes, onions and a few jalapenos. Don’t forget fruit salads. These can be a few cans of pineapple and mandarin oranges mixed with vanilla yogurt, or an ensemble of bananas, pineapple, and melon balls. Fruit salads add a welcome note of coolness to the meal’s aftermath. One of the delights of summer is slices of fresh melon eaten right off the rind. Watermelon, cantaloupe and honeydew all qualify. A delicious cold dish you can prepare earlier in the day. Toss potatoes and pickle relish with mayonnaise and boiled egg slices, or use your secret family recipe. Chips and salsa are a great appetizer to set out for guests to nibble while the other food cooks. Make your own salsa with grilled tomatoes, peppers and onions and serve it to your guests. A jar from the grocery store works well if you’re in a hurry. Pork and beans make great companions to burgers or hot dogs. Baked beans go well with everything. If you’re trying to cook as little as possible, open a couple of cans and zap them in the microwave. Or cook up your own beans from scratch. Grilling dinner is fun, whether you’re cooking for guests or yourself. Most side dishes are easy to throw together and guests are happy to eat them up. If you have always thought of borage as decoration for a Pimm’s Cup only consumed at Wimbledon and cricket matches in England, take another look. Borage is native to northern Europe, but grows well in temperate regions of the Mediterranean and North America. The borage plant blooms in summer with blue, bell-shaped flowers and dark green leaves. Seeds germinate easily, and the plant grows to a height of about 18 inches. It is a self-seeding annual that likes to take over rich garden soil. The young leaves have a flavor resembling cucumber, and are excellent flavor enhancers for almost any dish using tomatoes, cucumbers, or squash. Aside from a Pimm’s Cup concoction of Pimm’s No. 1 Cup gin-based liquor (1-1/2 oz), dash of lemon juiice, ginger ale, and cucumber wheels; borage leaves and flowers are garnishments for many gin-based cocktails. Traditionally, it has been considered a euphoriant when added to spirits. The blue flowers and young leaves are excllent additions for garden salads, dips and cold soups. Always chop the leaves to destroy the look of “hairiness” on the leaves when left whole. Chopped leaves are an excellent, fresh, last minute addition to a soup or stew. Mix two parts cabbage, one part borage leaves, season, and cook for a delicious “new” cooked vegetable dish. Candied borage flowers are pretty cake decorations. Gather your flowers early in the morning, let them dry, brush lightly with egg white, and sprinkle with super-fine sugar. Borage leaves do not dry well for culinary use, but the dried blue flowers are excellent color additions to potpourri. Borage helps reduce fevers, stimulates the kidneys, and aids chronic chest problems. It contains a number of alkaloids, tannins, mucilage, and large amounts of gamma linoleum acid (GLA). Borage is also rich in minerals, especially potassium. This suggests it is an excellent remedy for PMS, rheumatoid arthritis, and eczema. The simplest tea, (toss some leaves into a mug with boiling water, steep for ten minutes, strain and drink one hour before bedtime), promotes a restful night’s sleep. Borage is a tonic to help the adrenal system deal with stressful lifestyles. Borage tisanes tend to be light and delicate in nature, and results are gradual and sometimes open to question. It is often combined with other fresh herbs for a relaxing and comforting drink. This mixture, enhanced with additional leaves, is also an excellent facial steam for improving dry, sensitive skin. Place the steaming mixture in a bowl, cover your head and the bowl with a towel, and enjoy the vapors for 8 to 10 minutes. Borage is one of the herbs of summer that brings enjoyment all its own. Use singularly, or combine with other sweet and gentle herbs to find your favorite flavors as you include borage in your culinary and personal collection of summer pleasures. Coffee has been consumed for centuries. In spite of repeated attempts to prohibit its use for moral, economic, medical or political reasons. It was discovered in the 9th century in Arabia and it was cultivated for the first time in Ethiopia. In the 15th century, the technique of toasting and grinding coffee grains was developed and the consumption of coffee quickly expanded worldwide. Coffee is the dried mature seed of Coffea Arabica. It is the product that contains the highest amount of caffeine in the diet (0.8-1.8%). The dose of caffeine in coffee depends on genetic differences between grains, as well as on the time and the form of preparation. Varying between 30 and 175 mg by 150 ml. Decaffeinated coffee contains between 2 and 8 mg by 150 ml. Caffeine, as well as theobromine and theophylline, is a methyl-derivative of xanthine, which is itself a purine-derivative. It is included in the pharmacological group of psycho-stimulants. Caffeine induces a generalized activation of the central nervous system, in a dose-dependent manner, possibly by enhancing the release of noradrenaline. It increases the alert, reduces the sensation of fatigue, it stimulates the capacity to maintain intellectual effort, and maintains the state of wakefulness in spite of sleep deprivation. In addition, caffeine has an invigorating action by means of dopamine release in the limbic system. Caffeine also has an analgesic effect, being sometimes used as an adjuvant in analgesia. It produces blood vessel constriction in the brain, which makes it an effective treatment for migraine. On the other hand, caffeine abuse can cause anxiety, panic attacks, nightmares, and dependency. Methyl-xanthines, especially theophylline, stimulate the respiratory nervous center, dilate the airways, and slightly improve the respiratory function, by increasing the force of contraction of the diaphragm muscle. Therefore, these substances are useful in asthma and other chronic or acute respiratory diseases. They are also first choice drugs in the treatment of apnea in the premature newborn. Caffeine administration increases the arterial pressure, the heart rate and the heart pumping capacity. However, caffeine ingestion has not been directly linked to hypertension risk, and it does not induce rhythm disturbances, except at very high doses. Most large prospective cohort studies have not found high intakes of coffee or caffeine to increase the risk of coronary heart disease or myocardial infarction. On the contrary, in Dutch women, coronary artery calcification was significantly reduced by 60% for moderate (4 cups) and by 46% for high (over 4 cups) coffee intake, compared with a daily intake of 3 cups or less. Caffeine has a mild, but durable diuretic effect. However, caffeine consumption of up to 500 mg/day does not cause dehydration or chronic water imbalance. Coffee’s fluid content compensates for the acute diuretic effect. Caffeine boosts the physical energy, by increasing the blood flow to the muscles, the muscular response to nervous stimuli, and by diminishing weariness and fatigue. In the past years, caffeine was forbidden in sports and “doping” was considered if 12 mcg/ml in urine were exceeded. (To yield a positive result, it would be necessary to drink 7 or 8 cups of coffee and pick up a sample 2 to 3 hours later.) Since 2004, caffeine is no longer listed among prohibited substances in sports and thus it can be consumed without restriction. Caffeine stimulates the contractions of the gallbladder, relaxes the smooth muscles of the biliary tract, and stimulates gastric acid secretion, thus helping digestion. Coffee drinking is unlikely associated with gastric or duodenal ulcers, but it can exacerbate gastroesophageal reflux. The consumption of boiled, unfiltered coffee has been found to increase plasma total and LDL-cholesterol concentrations. Whereas the consumption of filtered coffee does not appear to have adverse effects on lipid profiles. The diterpenes cafestol and kahweol have been identified as cholesterol-raising factors in roasted coffee beans. Diterpenes are extracted by hot water when coffee is brewed, and they are trapped by paper filters. Consequently, filtered coffee contains very little cafestol and kahweol, whereas boiled coffee and espresso may contain significant amounts. Moderate caffeine consumption during pregnancy does not increase the risk of miscarriage and low birth weight. However, such risks can be induced by excessive coffee intake. Therefore, pregnant women are often advised to limit caffeine consumption. Coffee drinking has also been related with health benefits, by possibly preventing chronic conditions like diabetes, Parkinson’s and other neurological disorders, and cancer. In short-term studies, caffeine has been shown to increase insulin levels, reduce insulin sensitivity, and increase cortisol levels. On the other hand, most epidemiological studies (there are fourteen, at least) confirm a protective effect of coffee against type 2 diabetes, with some dose-response in function of the degree of daily consumption. The observed effect is rather impressive (the risk is reduced by 30 to 60 percent) and is present whatever the type of population. It appears equal, or even greater, with decaffeinated coffee as compared to regular coffee. For example, in Japan, coffee drinking was related with a reduction in the prevalence of metabolic syndrome (i.e. a cluster of disorders, including obesity, hypertension, glucose intolerance, and lipid abnormalities) and diabetes. Those who drink at least 3 cups have 42% less diabetes than those who drink less than 1 cup a day. The protective effect cannot be attributed exclusively to caffeine, but rather it should be explained by other coffee components, most probably chlorogenic acid and/or quinides. Which may posses antioxidant and weight-losing properties. However, the precise mechanism explaining the protection of coffee against type 2 diabetes and its potential relevance in public health remain to be specified. Coffee and caffeine consumption have been consistently associated with significant reductions in the risk of Parkinson’s disease. For instance, among 30,000 Finnish men and women, coffee drinkers had a 47% (with 1-4 daily cups) to 60% (with 5 or more daily cups) lower risk of developing the disease than non-drinkers. Similarly, an American study found that high caffeine intake reduces the risk of Parkinson’s disease by 42%. It has also been suggested that caffeine may be useful for preventing other neuro-degenerative disorders, like Alzheimer’s and Huntington’s. In Finland again, high coffee intake was found to be associated with less stroke from brain infarction. Finally, two prospective cohort studies in the United States found a significant decrease in suicide risk with coffee consumption. Caffeine displays suppressor effects on malignant cells in experimental metastases. In a Japanese study, women who regularly consumed 3 or more cups of coffee per day had a 56% lower risk of developing bowel cancer than those who almost never consumed coffee. However, no similar association was found in men. In Italy, the risk of liver cancer decreased for increasing levels of coffee intake (this being true for regular coffee but not for decaffeinated coffee). On the other hand, the existing studies failed to point out any significant association between coffee drinking and the occurrence of ovarian, breast, pancreas or renal cancers. According to some research, coffee has shown a reduced risk of death with moderate (1 to 4 cups/day) drinking. For example, in a study which included Japanese men (40-79 years), those who consumed 2+ cups/day of coffee had a 57% lower mortality risk compared with those who consumed less than 1/2 cup/day. No statistically significant effect was seen in women. In a California study of 8,600 women and 5,000 men with a mean age of 74, followed for 23 years, caffeine consumption exhibited a U-shaped mortality curve. Moderate caffeine consumers had a significantly reduced risk of death compared to low or non-consumers. In contrast, other studies have found no association of coffee consumption and mortality or a slightly increased risk. Coffee contains many different chemical compounds and no certainty exists as to which ones may be associated with disease risk. Antioxidants like chlorogenic and caffeic acids may reduce mortality by decreasing the incidence of cardiovascular disease, cancer, and dementia. In conclusion, coffee drinking stimulates the nervous system, increases the physical capacity, and improves breathing. It is useful for the treatment of migraine. It does not induce chronic hypertension, heartbeat abnormalities, or coronary heart disease. 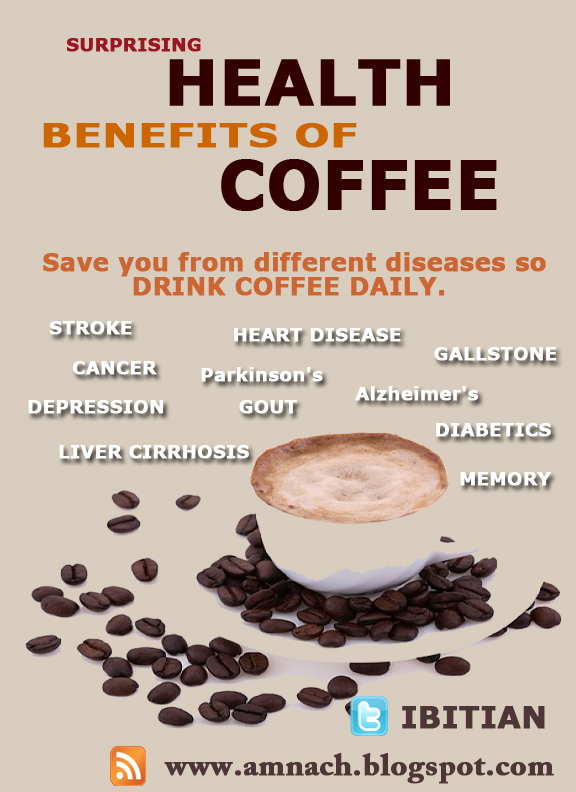 In addition, regular coffee intake might prevent diabetes, neurological disorders, cancer, and decrease mortality. Therefore, if abusive consumption is avoided, coffee can be considered a healthy beverage. When deciding to host a barbecue at your place let alone be the one that operates the grill, you may need further help. There is nothing wrong with getting help. You want to make sure that everything is cooked enough that everything is juicy and tasty. 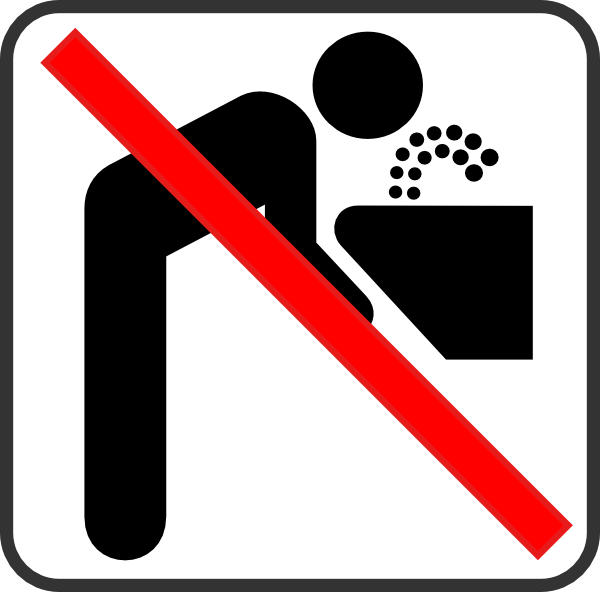 At the same time, you do not want to serve food that could give people food poisoning. You should already have access to high-speed Internet. If that is the case, take full advantage of resources that are offered. For barbecue grilling tips, you should consult the Internet. However, you do not want to go to any source. You want to go to reliable sources for the most part. The first website to check out is “The Reluctant Gourmet.” This is for person that have less confidence about their skill on the grill also known as “grill skill” or “skill of grill.” This is for beginner and intermediate grill operators. Reluctant Gourmet gives a tutorial on grilling, clean grills, hot grills, preparation ingredients, and so forth. The second website to check out is “Your Barbecue.” You get your basic barbecue tips. Plus, you get further tips when working with burgers, steaks, chops, and so forth. The third website to check out is “Barbecue’n On The Internet.” This website gives a more in-depth tutorial when it comes to barbecue. Barbecue’n has numerous tips such as the following: preventing rusted out grills, using marinades, cleaning the meat, preparing pork ribs, winter cooking, flavorful salmon, glazing your meat, and many others. The fourth website to check out is “Aussie Grilling Planks.” This is a good website to check out because barbecue is a major thing in Australia. Australians do take their grilling and barbecue very seriously. As a result, this website has great tips for any person to look at in respects to barbecue. The fifth website to check out is “Charcoal Grilling Guru.” This website has numerous articles in regards to barbecue. You will get tips such as grilling corn on the cob, grilling steak, roasting a turkey, cooking beef brisket, pulling pork, building your own pit barbecue, making marinades, and many other interesting things about barbecue. Also, you should check out YouTube. Social media outlets, such as YouTube, are great places to find the latest barbecue tips. You should check out YouTube shows such as “BBQ Pit Boys Old-Time Barbecue,” “Working Class Foodies,” “VendrTV,” “Barbecue America,” and so forth. These are the best places so far to look when it comes to barbecue tips. However, you should take advantage of social media as people will post their own barbecue tips online.